Yep Leading up to Free Press Summer Festival, I was so excited to cover my first music fest in Houston. I’ve covered similar events before in Houston, but never an all-exclusive music one. There were various activities to keep the fans busy throughout the whole event with back-to-back shows for the 12 hour period. It was a very unique experience. Kay Weathers, one of the first artists to kick off the festival at the Saturn Stage, brought to Houston a soulful sound. Music that’s slow and so mellow, you can chill and vibe with. While on set, she brought out a surprise guest appearance: Genesis Blu. The two ladies went on into a good ole H-town freestyle session. Deep Cuts – a native Houston band – also performed at FPSF. They have a unique style by blending both; Alternative Rock and Jazz into one, cool mix. DREAMERS were the next band to take the stage. The band was rocking so hard, they had the crowd running back to the Neptune stage. It was hot and sunny, but the fans paid no mind whatsoever. Khruangbin also made an appearance at FPSF, bringing back 70’s style Retro into the modern day. With very few lyrics, this band is all sound; a sound with the likes of Bill Withers and Looking Glass. Afterwards, I started hearing a nice, EDM beat coming from the Mercury stage. I walked on over and saw Vanic, surrounded by a hyped crowd. Rain or shine, Vanic definitely knows how to throw a party. The sun came back out with a vengeance, but that didn’t stop the crowd from going to see Trill Sammy, another native Houston Hip Hop artist. He brought Trap to the stage and the crowd got “turnt up” as the cool kids like to say. Jon Bellion came to the main stage, bringing a Hip Hop and Pop fused mix of old and new material. Jon’s music reminds me of the style of B.O.B. and the fans had fun singing along with him and his band. Cherry Glazerr opened the show that afternoon. They were goofy and funny, but tore up the stage once they started playing. Lead singer and guitarist, Clementine Creevy, was amazing with her wild, Grunge style guitar solos. The band, K.I.D, was corky and very Punk Rock with their style of music. The band and lead singer interacted very well with the crowd. The last to close out was Hippo Campus, an Indie Rock band that took over the Budweiser Stage. The field was so wet and full of mud, you could barely walk, but that do stop the fans from getting up close and personal with the band. It’s nearly impossible for an event to go smoothly and flawless without any problems. This event was no different. First, finding parking was hectic and maneuvering your way through downtown Houston construction made it all the more difficult. Got to give credit where its due though, FPSF warned everyone about the parking situation ahead of time. If you were lucky enough to find a spot, you still had to walk through a maze to get to the entrance of the festival. Second, there were no visible signs or banners showcasing directions to the entrance. Lastly, more communication was needed between the staff and security teams working the event. 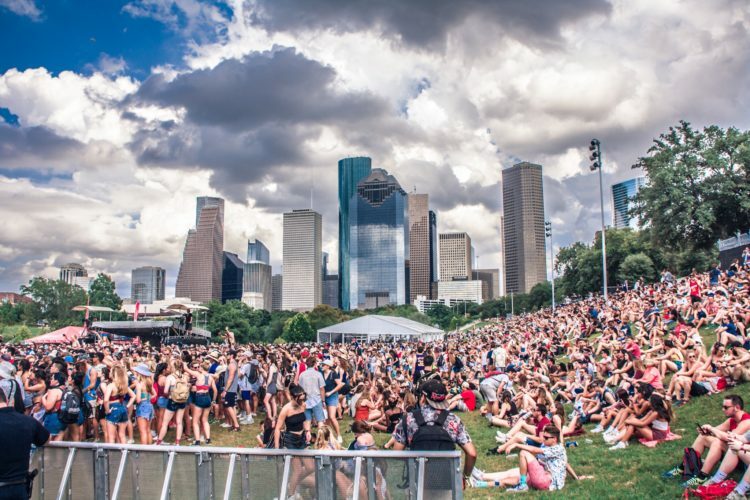 The weather played a big factor at FPSF 2017. Everybody’s schedule was cut short due to the storm. On Saturday, despite a two-hour delay, the fans got to see a little over half of the performers. Sunday, however, was a different story. Everyone was being evacuated a little bit before 3:00 PM. Although there was a possibility of the suspension being lifted, the event was then cancelled due to the constant bad weather. As I walked towards my car, I could see the disappointment in many fan’s faces. Mother Nature won this year.